We expected that the US side would bring itself with a constructive proposal which would help build up trust true to the spirit of the DPRK-U.S. summit meeting and talks. We, on our part, were also thinking of doing something which corresponds with it. It was, however, so regretful to mention what the US side had shown in its attitude and stand at the first DPRK-U.S. high-level talks held on 6 and 7 July. The DPRK side, during the talks, put forward the constructive proposals to seek a balanced implementation of all the provisions of the Joint Statement out of its firm willingness to remain faithful to the implementation of the spirit and agreed points of the DPRK-US summit meeting and talks. These include taking wide-ranging proactive steps of simultaneous actions in a respective manner such as realizing multilateral exchanges for improved relations between the DPRK and the US, making public a declaration on the end of war first on the occasion of the 65th anniversary of the signing of the Korean Armistice Agreement to build a peace regime on the Korean Peninsula, dismantling the test ground of high thrust engine to make a physical verification of the suspension of ICBM production as part of denuclearization steps and making an earliest start of the working-level talks for recovering POW/MIA remains. 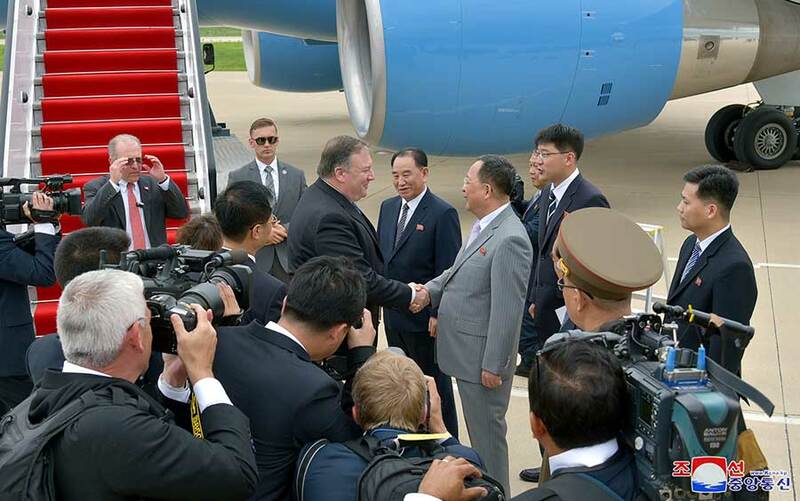 Before the talks, Kim Yong Chol, vice-chairman of the Central Committee of the Workers’ Party of Korea, who is also a chief delegate from our side to the talks, was authorized to convey with a due respect to US State Secretary Pompeo a personal letter sent from Chairman of the State Affairs Commission of the DPRK Kim Jong Un (Kim Cho’ng-u’n) to President Trump. Chairman Kim Jong Un expressed his expectation and conviction that good personal relations forged with President Trump and his sentiments of good faith built towards the latter at the Singapore summit and talks would be further consolidated through the process of future dialogues such as high-level talks this time. But, the US side came up only with its unilateral and gangster-like demands for denuclearization just calling for CVID, declaration and verification, all of which run counter to the spirit of the Singapore summit meeting and talks. The US side never mentioned the issue of establishing a peace regime on the Korean peninsula which is essential for defusing tension and preventing a war. It took the position that it would even backtrack on the issue it had agreed on to end the status of war under certain conditions and excuses. As for the issue of announcing the declaration of the end of war at an early date, it is the first process of defusing tension and establishing a lasting peace regime on the Korean peninsula, and at the same time, it constitutes a first factor in creating trust between the DPRK and the US. This issue was also stipulated in P’anmunjo’m Declaration as a historical task to terminate the war status on the Korean peninsula which continues for nearly 70 years. President Trump, too, was more enthusiastic about this issue at the DPRK-US summit talks. The issues the US side insisted on at the talks are all roots of troubles, which the previous administrations also had insisted on to disrupt the dialogue processes, stoke the distrust and increase the danger of war. The US side, during the talks, made a great publicity about suspension of one or two joint military exercises. But suspension of one action called exercises is a highly reversible step which can be resumed anytime at any moment as all of its military force remains intact in its previously-held positions without scraping even a rifle. This is incomparable with the irreversible step taken by the DPRK to explode and dismantle the nuclear test ground. The results of the talks can’t but be so apprehensive. We thought that the US side would come with a constructive proposal which accords with the spirit of the DPRK-U.S. summit meeting and talks. But expectation and hope of ours were so naive as to be foolish. Conventional ways can never create new things. Treading on trite stereotypes of all the failure would invite another failure only. Valuable agreement was reached in such a short time at the Singapore summit talks, the first ever in the history of the DPRK-US relations. This is attributable to the fact that President Trump himself said he would move towards resolving the DPRK-US relations and the issue of denuclearization of the Korean peninsula in a new way. If both sides at the working level reneged on the new way agreed at the summit and returned to the old way, the epoch-making Singapore summit would be meaningless, which was held thanks to the determinations and wills of the two top leaders to open a new future for the interests of the two peoples and peace and security of the world. The first DPRK-US high-level talks this time brought us in a dangerous situation where we may be shaken in our unshakable will for denuclearization, rather than consolidating trust between the DPRK and the US. In the last few months, we displayed maximum patience and watched the US while initiating good-will steps as many as we can. But, it seems that the US misunderstood our goodwill and patience. The US is fatally mistaken if it went to the extent of regarding that the DPRK would be compelled to accept, out of its patience, the demands reflecting its gangster-like mindset. A shorter way to denuclearization on the Korean peninsula is to remove deep-rooted mistrust and build up trust between the DPRK and the US. For this, both sides should be bold enough to be free from old ways which had only recorded failures and resolve the problem in a fresh manner which is never bound by the existing ways. A shortcut to it is also to take a step-by-step approach and follow the principle of simultaneous actions in resolving what is feasible one by one while giving priority to creating trust. But, if the US, being captivated in a fidget, tries to force upon us the old ways claimed by the previous administrations, this will get us nowhere. If the objective situation does not stand in favor of the denuclearization against our wills, this would rather cast a heavy cloud over the atmosphere of developing bilateral relations which had shown its good movement in its beginning. Should the headwind begin to blow, it would cause a great disappointment not only to the international society aspiring after global peace and security but also to both the DPRK and the US. If so, this will finally make each side seek for another choice and there is no guarantee that this will not result into yet another tragedy. We still cherish our good faith in President Trump. The US should make a serious consideration of whether the toleration of the headwind against the wills of the two top leaders would meet the aspirations and expectations of the world people as well as the interests of its country.